7188 EP TONGA (1981) Sailing ship - arrival of Maurelle*. Monochrome proof on card. 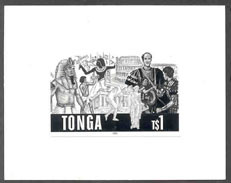 Discovery of Tonga by Maurelle. Scott No 489, Yvert No 484. 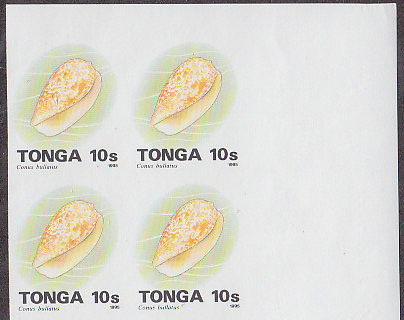 7189 EP TONGA (1981) Map of Island*. Cromalin proof on card. 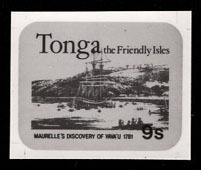 Discovery of Tonga by Maurelle. Scott No 490, Yvert No 485. 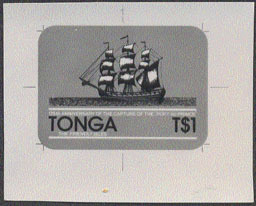 7680 EP TONGA (1981) Sailing ship*. Map of Islands*. Monochrome proof on card. Capture of ship "Port-au-Prince. Scott No 499, Yvert No 494. 7681 EP TONGA (1981) Sinking of "Port-au-Prince"*. Monochrome proof on card. Capture of ship "Port-au-Prince. Scott No 500, Yvert No 495. 7682 EP TONGA (1981) Ship of "Port-au-Prince"*. Monochrome proof on card. Capture of ship "Port-au-Prince. Scott No 501, Yvert No 496. 7021 EP TONGA (1983) Concorde*. Balloon*. Modern ship*. Sailing ship*. Monochrome proof on thin cardboard, from the printer's archive. Very limited quantities produced. 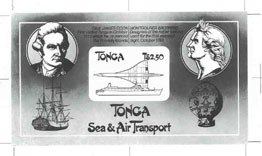 Sea and Air Transport souvenir sheet. Scott No 536. Scarce! 3568 EP TONGA (1984) Parrot*. Cromalin proof on heavy cardboard from printer's archives. 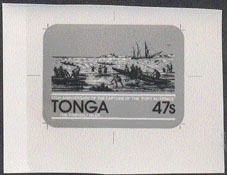 Reproduction of Tonga #51 for Aussipex '84. Scott No 589, Yvert No 583. Only 3-4 exist. Extraordinary margins and very lovely! 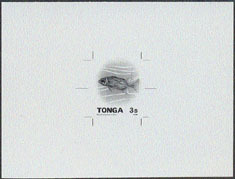 7245 EP TONGA (1984) Fish*. Compound monochrome proof of fish from shells & fish series. Shows the 6 different fish. 7246 EP TONGA (1984) Red soldierfish*. Cromalin proof on card. Scott No 565, Yvert No 566. 7247 EP TONGA (1984) Zebra shark*. Cromalin proof on card. Scott No 568, Yvert No 567. 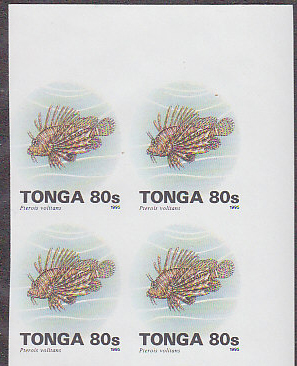 7248 EP TONGA (1984) Red lionfish*. Monochrome proof on card. Scott No 570, Yvert No 568. 7249 EP TONGA (1984) Damselfish*. Cromalin proof on card. Scott No 572, Yvert No 569. 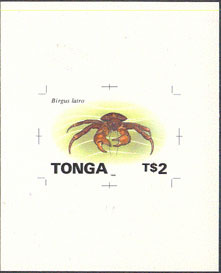 7573 EP TONGA (1984) Coconut crab*. Cromalin proof on card. Scott No 577, Yvert No 585. 6686 EP TONGA (1988) Brown booby*. Cromalin proof on card. Scott No 691, Yvert No 707. 3666 EP TONGA (1989) Butterfly Hypolimnas bolina. Monochrome artwork proof on thin cardboard without values or words, made directly from the artwork to see how the design would look at stamp size. Scott No 714, Yvert No 729. Only one proof was done for this design. Unique!! 3667 EP TONGA (1989) Butterfly Hypolimnas bolina. Monochrome proof on thin cardboard with mockup of values or words added, made after the artwork was accepted to see where the words and values would go. Scott No 714, Yvert No 729. Only one proof of this type was done. Unique!! 3668 EP TONGA (1989) Butterfly Jamides bochus. Monochrome proof on thin cardboard with mockup of values or words added, made after the artwork was accepted to see where the words and values would go. Scott No 715, Yvert No 730. Only one proof of this type was done. Unique!! 3669 EP TONGA (1989) Butterfly Jamides bochus. Monochrome artwork proof on thin cardboard without values or words, made directly from the artwork to see how the design would look at stamp size. Scott No 715, Yvert No 730. Only one proof was done for this design. Unique!! 3670 EP TONGA (1989) Butterfly Melanitis leda solandra. Monochrome artwork proof on thin cardboard without values or words, made directly from the artwork to see how the design would look at stamp size. Scott No 716, Yvert No 731. Only one proof was done for this design. Unique!! 3671 EP TONGA (1989) Butterfly Melanitis leda solandraw. Monochrome proof on thin cardboard with mockup of values or words added, made after the artwork was accepted to see where the words and values would go. Scott No 716, Yvert No 731. Only one proof of this type was done. Unique!! 3672 EP TONGA (1989) Butterfly Danaus plexippus. Monochrome proof on thin cardboard with mockup of values or words added, made after the artwork was accepted to see where the words and values would go. Scott No 717, Yvert No 732. Onlyone proof of this type was done. Unique!! 3673 EP TONGA (1989) Butterfly Danaus plexippus. Monochrome artwork proof on thin cardboard without values or words, made directly from the artwork to see how the design would look at stamp size. Scott No 717, Yvert No 732. Only one proof was done for this design. Unique!! 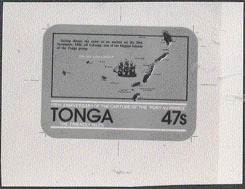 5441 EP TONGA (1989) Rugby Through the Ages*. This is a monochrome proof of the artwork sketch of the design for the rugby series issued for the opening of the National Sports Stadium. Striking similarity to the final design, but obviously arough draft. This proof was probably used to approve the design. Scott No 718, Yvert Nos 733-7. Unique! 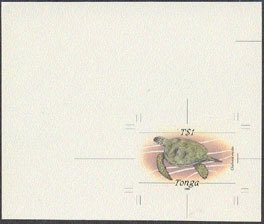 6102 EP TONGA (1989) Green sea turtle*. Cromalin proof on card. Scott No 705, Yvert No 725. 9788 EP TONGA (1989) Butterfly*. Cromalin proof in full color on thick, glossy cardboard. Hypolimnas bolina - the common or great eggfly. Scott No 714, Yvert No 729. Only a few exist! Rare! 9789 EP TONGA (1989) Dark Cerulean Butterfly "Jamides Bochus"*. Cromalin proof in full color on heavy cardboard from printer's archives. Scott No 715, Yvert No 730. Only 3-4 exist. Very rare! 9790 EP TONGA (1989) Brown Butterfly "Melanitis leda solandra*. Cromalin proof in full color on heavy cardboard from printer's archives. Scott No 716, Yvert No 731. Only 3-4 exist. Very rare! 11484 EP TONGA (1989) Rugby players*. Cromalin proof in full color on thick cardboard, from the printer's archives. Only 2-3 exist! Scott Nos 718a-e, Yvert Nos 733-7 :Rugby Through the Ages. Very rare! 15799 EP TONGA (1989) Butterfly*. 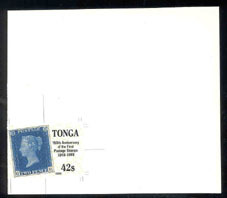 Progressive proof imperforate pair, the 2nd stamp in the pair shows only colors blue and yellow. Hypolimnas bolina - the common or great eggfly. Scott No 714, Yvert No 729. Only a few exist! Rare! 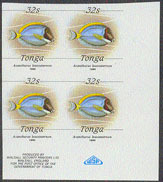 7252 EP TONGA (1990) Surgeonfish*. Imperforate plate proofs in marginal block of 4. Usually only one sheet of 40 of these proofs was printed. Scott No 759, Yvert No 789. 8136 EP TONGA (1990) Conus bullatus*. Trial color imperforate plate proofs in marginal block of 4. Usually only one sheet of 40 of these proofs was printed. Scott No 758, Yvert No 788. 9163 EP TONGA (1990a) Turtle*. Stamp-on-stamp*. Cromalin proof in full color on thick, glossy cardboard. 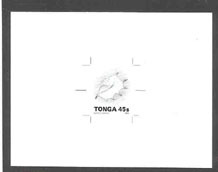 From 1897 to 1942, all Tongan stamps had turtle watermarks. 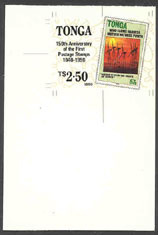 This set commemorating the 150th anniversary of the first postage stamp showed the watermark on the front of stamp, and hence on the proof also. Only a few exist! Scott No 739, Yvert No 771. Rare! 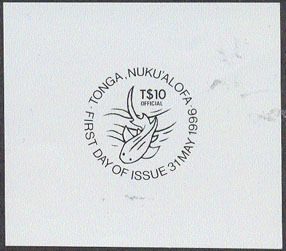 9164 EP TONGA (1990b) Turtle*. Stamp-on-stamp*. Cromalin proof in full color on thick, glossy cardboard. 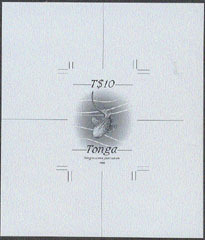 From 1897 to 1942, all Tongan stamps had turtle watermarks. This set commemorating the 150th anniversary of the first postage stamp showed the watermark on the front of stamp, and hence on the proof also. Only a few exist! Scott No 740, Yvert No 772. Rare! 10079 EP TONGA (1990b) Broken glass* on beach*. Sun*. Shark fins*. Cromalin proof in full color on thick, glossy cardboard. Health and Safety issue inscribed "Swim From Safe Beaches" and "Beware of Broken Glass." Scott No 770b-c, Yvert No 812-3. Only a few exist! Rare! 11226 EP TONGA (1990a) Native catamaran*. Proof strip of 2 and gutter illustration from printer's archives. Polynesian explorers - "Bidding farewell." Scott No 748, Yvert No 776. Scarce! 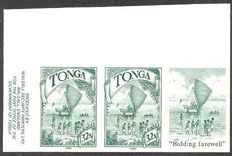 11886 EP TONGA (1990) Windmills*. Chromalin proof in full color from printer's archive. Scott No 743, Yvert No 775. Only 2-3 exist. Rare! 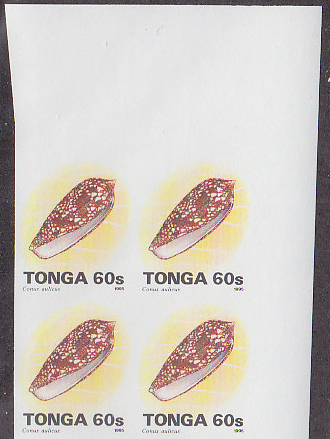 17396 EP TONGA (1990) Lawn bowling*. Cromalin proof in full color from the printer's archives. Scott No 733, Yvert No 762. 5325 EP TONGA (1991) Rowers* in outrigger canoe*. Cromalin proof in full color. Rowing Festival. Only 2-3 cromalin proofs were made. Scott No 780, Yvert No 834. Very rare! 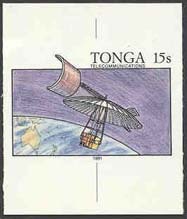 11608 EP TONGA (1991) Communications satellite*. Cromalin proof in full color from the printer's archives. Scott No 783b, Yvert No 821. 7577 EP TONGA (1992) White-spotted hermit crab*. Monochrome proof on card. Scott No 802, Yvert No 862. 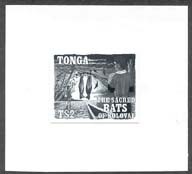 9074 EP TONGA (1992) Bats*. Monochrome proof (same size as stamp) mounted on cardboard, sent to printer to check design. Sacred bats of Kolovia - Kula leaving for Upolo. Scott No 823a, Yvert No BF17. Issued as a souvenir sheet. Rare! 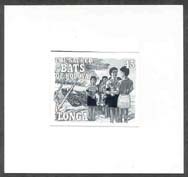 9075 EP TONGA (1992) Bats*. Monochrome proof (same size as stamp) mounted on cardboard, sent to printer to check design. Sacred bats of Kolovia - Kula looking through path of fires. Scott No 823b, Yvert No BF17. Issued as a souvenir sheet. Rare! 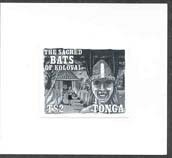 9076 EP TONGA (1992) Bats*. Monochrome proof (same size as stamp) mounted on cardboard, sent to printer to check design. Sacred bats of Kolovia - Kula walking down path, Hila. Scott No 823c, Yvert No BF17. Issued as a souvenir sheet. Rare! 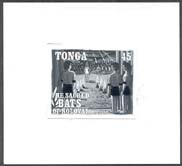 9077 EP TONGA (1992) Bats*. Monochrome proof (same size as stamp) mounted on cardboard, sent to printer to check design. Sacred bats of Kolovia - Kula leaving with pet fruit bats. Scott No 823d, Yvert No BF17. Issued as a souvenir sheet. Rare! 7254 EP TONGA (1993) Holocentrus ruber*. Monochrome proof on thin cardboard, from the printer's archive. Scott No 799, Yvert No 917. 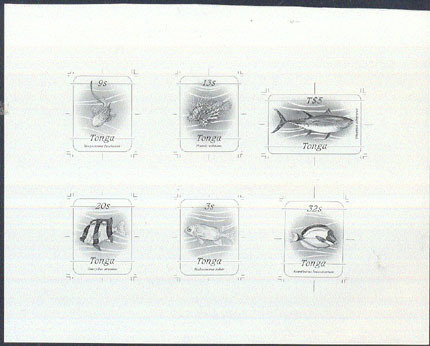 7255 EP TONGA (1993) Damselfish*. Monochrome proof on card. Scott No 803, Yvert No 920. 7256 EP TONGA (1993) Red lionfish*. Monochrome proof on thin cardboard. Scott No 806, Yvert No 923. 7257 EP TONGA (1993) Zebra shark*. Monochrome proof on thin cardboard. Scott No 807, Yvert No 924. 8137 EP TONGA (1993) Swansonia casta*. Monochrome proof on thin cardboard, from the printer's archive. Scott No 798, Yvert No 916. 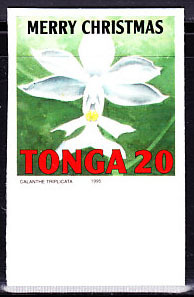 8138 EP TONGA (1993) Lambis truncata*. Monochrome proof on thin cardboard. Scott No 804, Yvert No 921. 16107 EP TONGA (1993) Fireman's badge*. Cromalin proof in full color from the printer's archives. 25th anniversary of fire and police service in Tonga. Scott No 840, Yvert No 924. Only 2-3 exist. 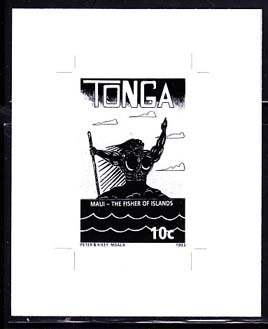 2213 EP TONGA (1994) Maui - The Fisher of Islands*. Monochrome proof on thin cardboard, from the printer's archive. Very limited quantities produced. Scott No 853a, Yvert No 944. Scarce! 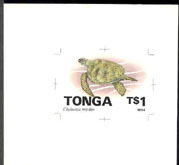 3175 EP TONGA (1994) Turtle*. Large sized cromalin proof in full color. 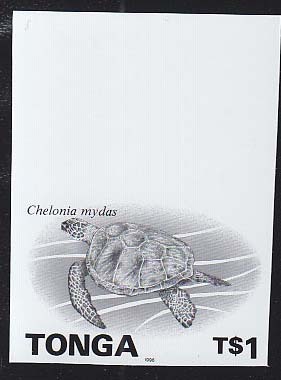 Chelonia mylas. Scott No 880, Yvert No 965. Only 2-3 color proofs were produced. Very rare! 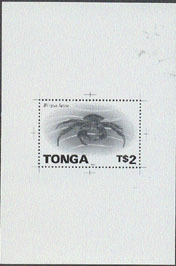 7578 EP TONGA (1994) Coconut crab*. Cromalin proof on card. Scott No 881. 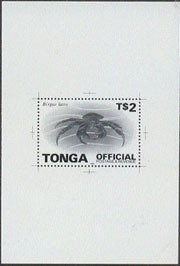 7579 EP TONGA (1994) Coconut crab*. Monochrome proof on card. Scott No 881. 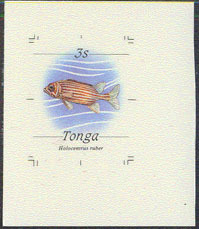 8139 EP TONGA (1994) Chicoreus palma-rosae*. Cromalin proof on card. Scott No 882, Yvert No 967. 10175 EP TONGA (1994) Tiger shark*. Monochrome proof on thin cardboard, from the printer's archive. Very limited quantities produced. Scott No 860, Yvert No 969. Scarce! 3513 EP TONGA (1995a) Bicycle*. Child*. Cromalin proof in full color on thick cardboard from printer's archives. Children of the Commonwealth (Polynesia). 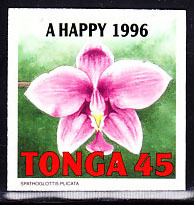 25th anniversary of Tonga's entry into British Commonwealth. Scott No 897, Yvert No 993. Only 3-4 exist. Very rare! 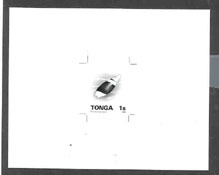 3514 EP TONGA (1995b) Bicycle*. Children*. Cromalin proof in full color on thick cardboard from printer's archives. Children of the Commonwealth (Asia). 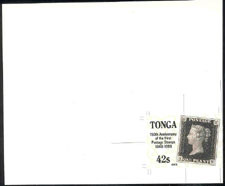 25th anniversary of Tonga's entry into British Commonwealth. Scott No 898, Yvert No 994. Only 3-4 exist. Very rare! 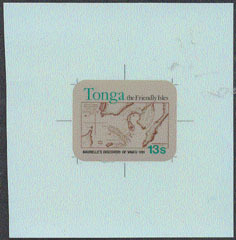 3515 EP TONGA (1995c) Bicycle*. Child*. Cromalin proof in full color on thick cardboard from printer's archives. Children of the Commonwealth (Africa). 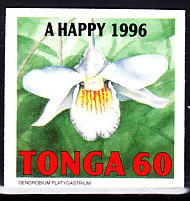 25th anniversary of Tonga's entry into British Commonwealth. Scott No 899, Yvert No 995. Only 3-4 exist. Very rare! 7258 EP TONGA (1995) Red Lionfish*. Imperforate plate proofs in marginal block of 4. Scott No 879. 7259 EP TONGA (1995) Zebra Shark*. Monochrome proof on card. Scott No 884, Yvert No 991. 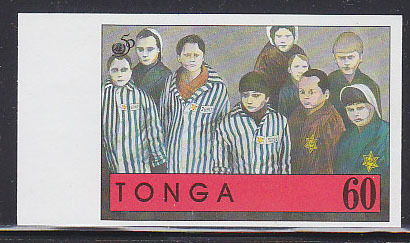 7518 EP TONGA (1995) Holocaust survivors*. Plate proof from the printer's archives. Scott No 905a, Yvert No 1026. 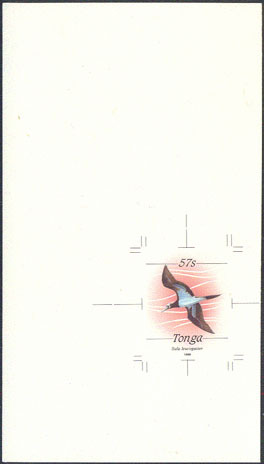 8140 EP TONGA (1995) Conus bullatus*. Imperforate plate proofs in marginal block of 4. Scott No 874. 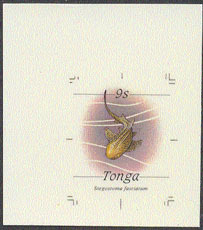 8142 EP TONGA (1995) Conus aulicus*. Imperforate plate proofs in marginal block of 4. Scott No 878. 10176 EP TONGA (1995) Shark*. Cromalin proof in full color on thick cardboard, from the printer's archives. Only 2-3 exist! Scott No 884, Yvert No 991: Stegostoma fasciatum. Very rare! 6104 EP TONGA (1996) Green sea turtle*. Monochrome proof on card. Scott No 920. 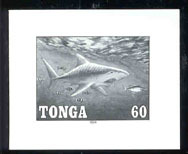 7260 EP TONGA (1996) Shark*. Monochrome proof of First Day Cancel for Official stamp. 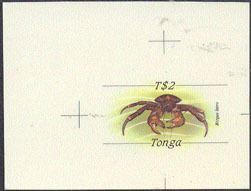 7580 EP TONGA (1996) Coconut crab*. Cromalin proof on card. Scott No 921. 7581 EP TONGA (1996) Coconut crab*. Monochrome proof on card with simulated perforations. Scott No 921. 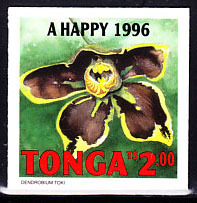 7582 EP TONGA (1996) Coconut crab*. 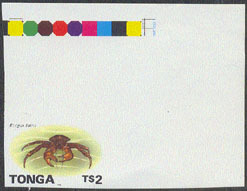 Imperforate plate proof from margin with color bars. Scott No 921. 7583 EP TONGA (1996) Coconut crab*. Monochrome proof on card. Scott No O84. 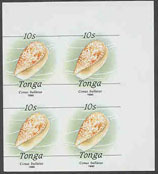 8145 EP TONGA (1996) Chicoreus palma-rosae*. Monochrome proof on card. Scott No 922. 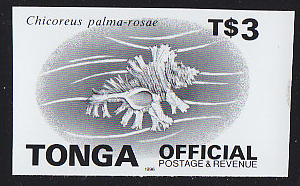 8146 EP TONGA (1996) Chicoreus palma-rosae*. Monochrome proof on card. Scott No O85. 9165 EP TONGA (1996) Green sea turtle*. Imperforate plate proof from sheet margin showing color code marks. Scott No 920. Scarce! 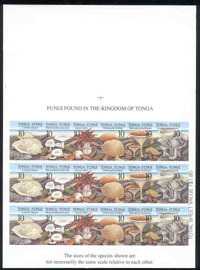 10349 EP TONGA (1996) Egyptians*. Greek statues*. Romans*. Coliseum*. Monochrome proof from the printer's archives mounted on cardboard. 13th Congress of International Union of Prehistoric and Protohistoric Sciences. Scott No 929b. Scarce! 16259 EP TONGA (1996) Orchid*. Cromalin proof in full color on thick cardboard, from the printer's archives. Only 2-3 exist! Scott No 907: Calanthe triplicata. 16260 EP TONGA (1996) Orchid*. Cromalin proof in full color on thick cardboard, from the printer's archives. Only 2-3 exist! Scott No 909: Spathoglottis plicata. 16261 EP TONGA (1996) Orchid*. Cromalin proof in full color on thick cardboard, from the printer's archives. Only 2-3 exist! Scott No 911: Dendrobium platagastium. 16262 EP TONGA (1996) Orchid*. Cromalin proof in full color on thick cardboard, from the printer's archives. Only 2-3 exist! Scott No 913: Dendrobium toki. 4780 EP TONGA (1997) Mushrooms*. Imperforate plate proof full sheet of 3 strips of 6. Scott No 976. Incredible! 10779 EP TONGA (1997) High school band*. Monochrome proof on thin cardboard, from the printer's archive. Very limited quantities produced. Scott No 966. 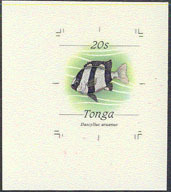 50th anniversary of Tonga High School. Scarce! 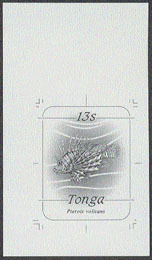 11659 EP TONGA (1997b) Clock face*. Ox*. 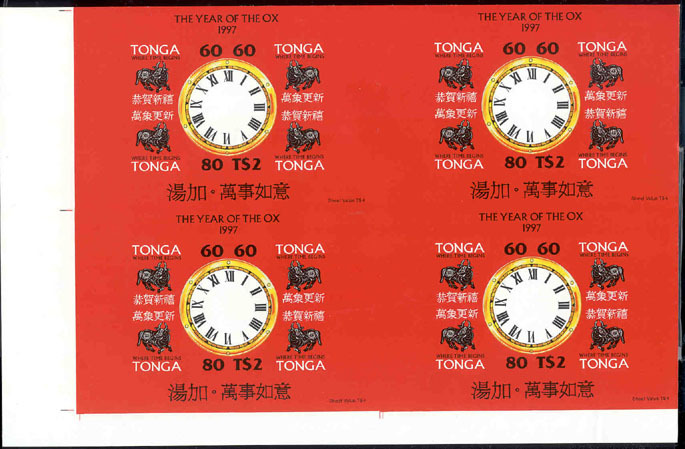 Sheet of 4 plate proofs of minisheet of 4 stamps issued for Year of the Ox, inscribed "Tonga - Where Time Begins." Only one large sheet of 16 blocks of 4 (4 times the size of this sheet) was printed.Since it was too large to send through the mail, the printer's archives broke it down into 4 blocks of 4 similar to this sheet. Most of those were cut up into smaller blocks. This may be the only sheet of 4 in existence! Scott No 942. Very rare! Spectacular!